This activist-submitted photo shows seven people on Kinder Morgan’s drilling barge Monday morning with an anti-Kinder Morgan banner. The Burnaby RCMP arrested seven people Monday for boarding the barge, which the company is using to conduct underwater drilling for soil samples. Photograph submitted to Burnaby Now. Police have arrested several activists that occupied a Kinder Morgan drilling barge near the Westridge Marine Terminal in Burnaby Monday morning. According to anti-pipeline activist Adam Gold, two protesters boarded the barge Sunday and stayed overnight. 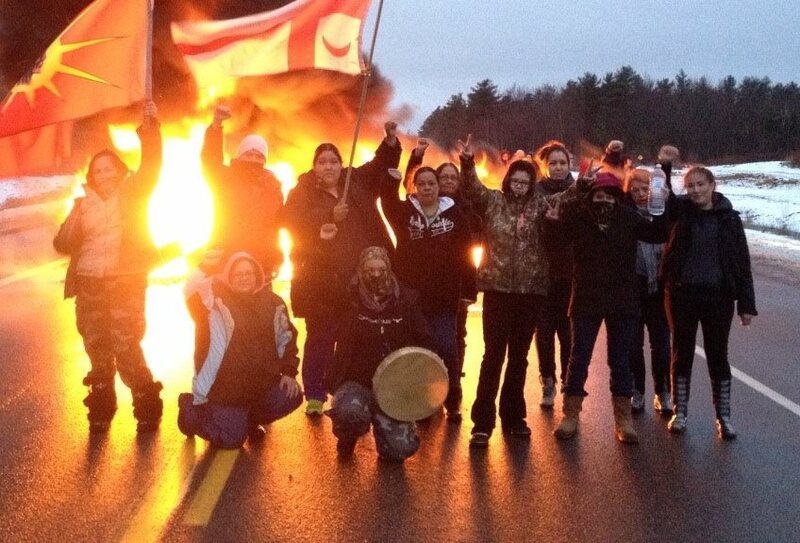 More protesters arrived to join them and bring supplies Monday morning. That’s when police showed up and removed the group. Xenoa Skinteh indicated his displeasure with the barge in Burrard Inlet before direct action took place today. Photo submitted to Georgia Straight. Activists have issued a news release claiming that they’ve seized a drilling barge near Westridge Marine Terminal. Around noon, it was boarded by two activists. The B.C. government says it can’t support the proposed $6.8-billion expansion of the Trans Mountain pipeline from Alberta to Burnaby. 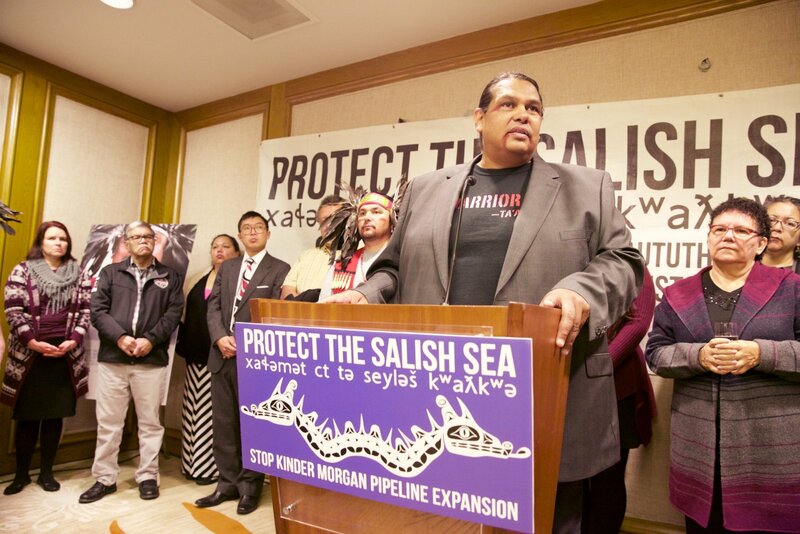 Tsleil-Waututh Nation spokesperson Rueben George at Vancouver press conference on Tuesday about a legal challenge to NEB’s Kinder Morgan pipeline hearing. Photo by Mychaylo Prystupa, National Observer. Under the banner, “Protect the Salish Sea,” a North Vancouver Indigenous community announced the start of its lawsuit against the National Energy Board (NEB) in federal court on Tuesday. The lawsuit attempts to stop the widely-criticized hearing process for the Kinder Morgan Trans Mountain pipeline expansion. Tsleil-Waututh Nation says the outgoing Harper government failed in its constitutional legal duty to adequately consult with their community when it began the NEB review of Kinder Morgan’s proposed $5.4-billion Edmonton-to-Burnaby pipeline expansion more than a year ago. The band is now seeking a court order to stop the hearing. 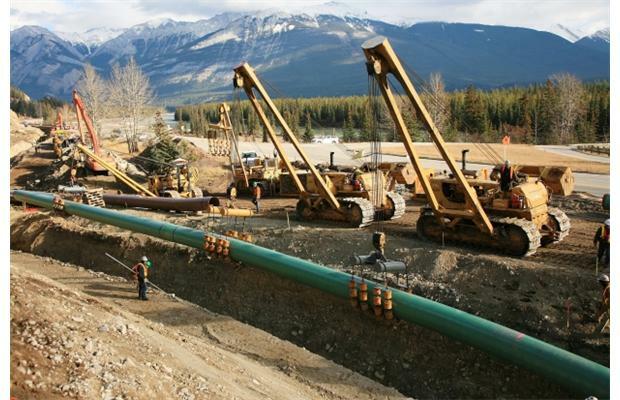 VANCOUVER — As the National Energy Board (NEB) gears up to hear final arguments on Aug. 24 into its embattled review of the proposed Kinder Morgan Trans Mountain Pipeline expansion, opposition is mounting as the price of oil drops, making the project less attractive. 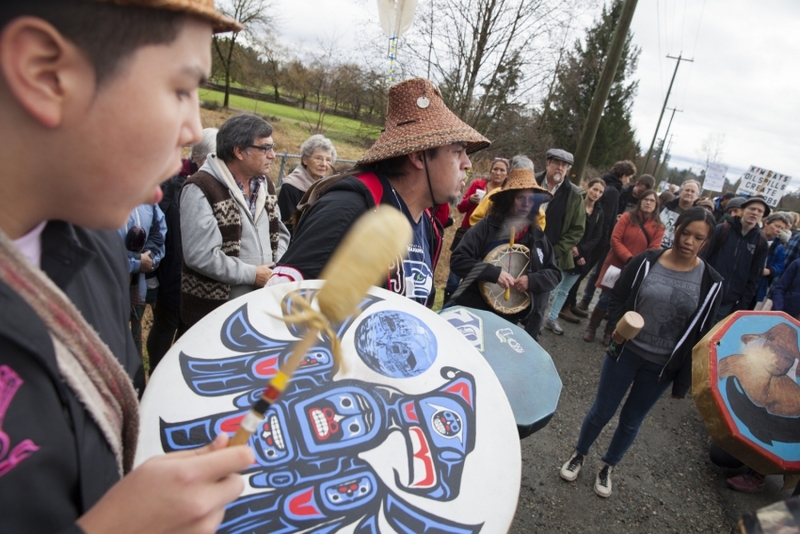 Langley marchers decry pipeline expansion through B.C. The march ended with speeches in Fort Langley. Several hundred people marched through Fort Langley Saturday to oppose the expansion of the Trans Mountain oil pipeline that runs through Langley. 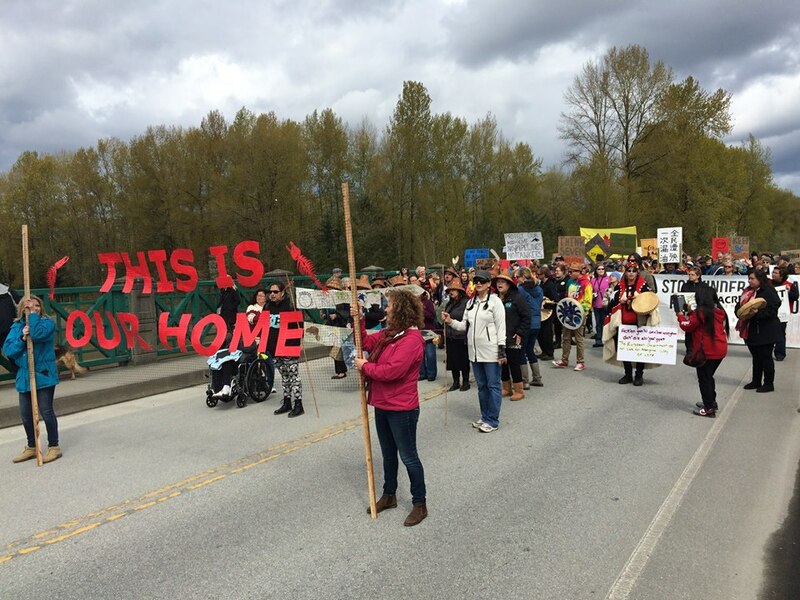 Organized by groups including the Pipe Up Network and the Kwantlen First Nation, the march headed from the Kwantlen reserve to the Fort Langley Community Hall. The march paused in the center of the Jacob Haldi Bridge that connects MacMillan Island to the village of Fort Langley. Above the Fraser River, Kwantlen members drummed and sang before the march continued. Aboriginal drummers with the Kwantlen First Nation at a Kinder Morgan protest Thursday Feb 5, 2015, near the Belmont Golf Course. Photo by Mychaylo Prystupa. “There was absolutely no communication whatsoever,” said band member Brandon Gabriel on Thursday. Awkward moment for cops on Burnaby Mountain as protester holds mirror in front of them, Nov 23, 2014. Photo by Mychaylo Prystupa, Vancouver Observer. BURNABY, B.C. – At least a dozen protesters were taken into custody Sunday on a mountain near Vancouver as a demonstrations continued against a controversial pipeline project. Dozens of people have been arrested since Thursday, when the RCMP began enforcing a court injunction ordering protesters to clear a pair of work sites on Burnaby Mountain, where Kinder Morgan is conducting drilling and survey work related to the proposed expansion of its Trans Mountain pipeline.